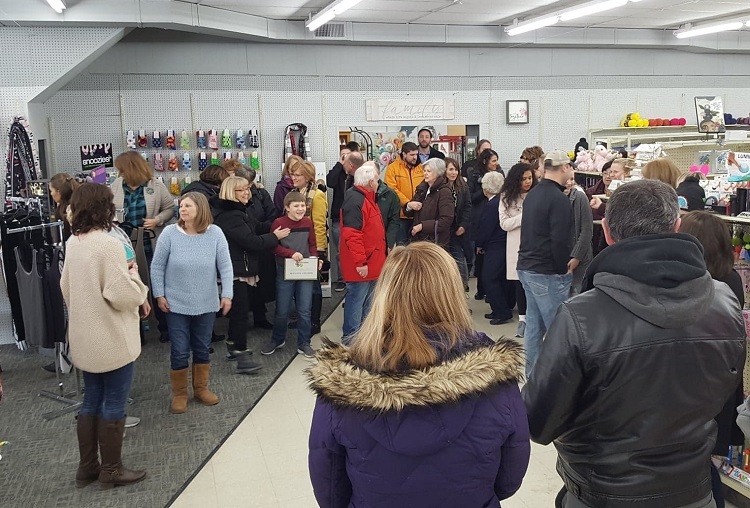 Andrea Menz Tunink, the new owner of Ben’s Five and Dime in Perry, compounded her happiness Thursday morning by celebrating her 39th birthday in the company of about 40 Perry Chamber of Commerce ribbon cutters. The Chamberites were on hand to welcome Tunink into the commercial community and thank her for maintaining Ben’s place as the retail centerpiece of downtown Perry. “My job this year is just to keep filling it up and keep promoting the downtown and keep people coming in the store,” Tunink said. She said the store has lots of fresh, new products. A good supply of candy and Valentine’s Day merchandise is on hand, along with a new sock wall that is a big favorite with the school girls. The winter apparel is 40 percent off. Flash sales are planned.